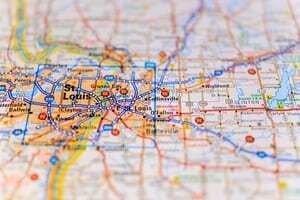 Delmar Boulevard divides North and South St. Louis by more than just geography. We think this real estate strategy can dissolve the divide. When city planners first built Delmar Boulevard, I don’t think they ever anticipated what it would eventually represent. Countless articles have been written about the Delmar Divide, the invisible line separating North St. Louis from the rest of the city, that roughly follows this relatively ordinary road. The thesis of those articles is largely the same: On one side of the street, neat row houses line quiet residential streets. On the other, dilapidated — or literally collapsing — buildings and few signs of economic activity. This narrative has followed Delmar Boulevard for years, and like most stories, it’s based in truth. Decades of discriminatory housing statues and rising prices have driven most of St. Louis’ African-American population north of the divide, while the neighborhoods below are overwhelmingly white. The divide is financial as well as racial; the average price of a home south of Delmar is $310,000, while a home to the north is only worth $78,000. The dramatic difference in these numbers have historically excluded North St. Louis from reaping the benefits of modern real estate development. But with the right development strategy, we can dissolve the Delmar Divide and allow everyone to share the wealth. North St. Louis presents an interesting and complex development challenge. The area desperately needs investment, but it has to be done thoughtfully and with consideration for the needs of its current residents. Towering luxury apartment complexes are neither appropriate for North St. Louis inhabitants nor financially sustainable for developers. Instead, we need to think about smarter ways to develop the area north of Delmar on a smaller, more manageable scale. Socially conscious development begins with socially conscious developers who see the opportunities that North St. Louis has to offer. Building affordable single and multi-family units — and managing them well — can provide steady sources of income while uplifting the city’s most vulnerable residents and, by extension, the economic health of St. Louis at large. At Radius, we’re committed to a number of promising projects north of Delmar Boulevard. In the past few months, we’ve worked with the Land Reauthorization Authority (LRA) to redevelop abandoned properties into affordable housing for low-income families. We’ve already invested over $200,000 in our largest project, a four-family plot with options for expansion to the lot next door. Our initial tours of these kinds of properties have generated the most interest of any unit we’ve ever showed, demonstrating the economic viability of this strategy. We’re just as interested in this project for its civic benefits as for its economic potential. We’re not looking to gentrify the area or displace its residents; our goal is sustained growth and development that brings the existing community with it. While we don’t expect to solve the Delmar Divide ourselves, we’re confident that we can make it more permeable. St. Louis’ economic growth requires investment in all areas of the city, not just the neighborhoods south of Delmar. As developers, we must remember that the Divide is more or less a social construct, an enduring prejudice that dissuades us from enjoying a vital and historic region of our city. We’re hoping to dispel some of those stereotypes with our projects in North St. Louis and help make the city whole in the process.